Daali thoy(dalitoy/dalithoy) is the first recipe learnt by all konkani people when they start cooking. It is simple daal with chilies, ginger, asafoetida etc. This is a must in almost all Konkani functions and festivals. May be one of the very important comfort food. The traditional recipe does not call for coriander leaves, but I like this dish with coriander leaves. Some places, like in South Kanara, ginger and turmeric are not added. But in North Kanara usually both of them are used for this dish. Konkani special basic dal spiced simply with ginger and a simple seasoning. Cook dal in pressure cooker with a pinch of turmeric, green chillies and finely chopped ginger. Typically it gets cooked in 3 whistles. Heat the cooked dal with salt. When it starts boiling, take off the heat. When mustard starts popping, add curry leaves and red chillies. Pour this seasoning over the cooked dal and close the lid. Serve with hot rice, ghee and lemon. Thanks Damodar. If you wish to see some specific recipe posted here, you can mention it in ‘recipe request’ and I will post about it. Shilpa … Yes we do not add turmeric, ginger and coriander leaves. Seasoning with coconut oil, mustard, curry leaves and hing (asfoetida). If there is any other variation done in SK or if i am wrong, anybody can let me know. My MIL prepares it in the way exactly mentioned above. I this variation of Dali thoy too. 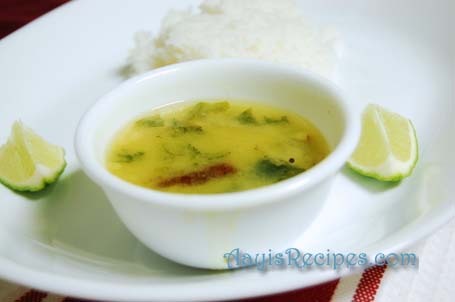 1. ginger and green chills are added to dal while cooking, but asafoetida is not added in the seasoning. 2. In case ginger is not added then the seasoning of hing is given. Goan style dalitoy is like this. Turdal is cooked with ginger-green chilly. Seasoned in ghee with mustard seeds, red chilly, lots of curry leaves and hing. And last but not the least is a freshly extracted coconut milk about 2-3 tblspns. No turmeric is added and the colour is white with red chilly and green kadipatta floating on it. Some people even add a tsp of sugar. Tell me how u liked this simple recipe. Mix all of the above and cook 1 minute. For tadka heat ghee or oil and add mustard seeds till they splutter. To this add crushed red chillies a little hing powder and chopped curry leaves. Some people like to eat dalithoi and rice with a drop of lemon juice. Ghee tastes really good but a lot of us are watching our cholesterol. What veena says is original Konkani Dalitoi… This is only dalitoi… what is posted is not Dalitoi… it is a version of dal. Sorry. Hi Veena, Thanks for your kind words about Aayi’s recipes. Even Aruna has mentioned the same recipe like yours above. I think this is what is followed in South Kanara. But In North Kanara, mostly we follow the recipe I mentioned. I love both the methods very much :). Please let me know how you liked this method. Feedbacks from you all is very important for improving this site. Thanks a lot. I have been in the US for 6 months now…first time I tried making dalithoy and it tasted awesome …thanks for the recipe …now I dont need to tell my mom I miss her dalithoy .. I guess this is what is so fantastic about our country. same ingredients, slight variations in usage, and voila, the dish takes on a differnt taste. This is a lovely website – keep the fantastic work going Shilpa. I can almost visualize sitting in an idyllic Konkan setting, the sea a few meters away, swaying coconut palms, fresh konkan fruit and spices, beautiful and gentle people, and some truly fantastic food! How about posting resipes using the amazingly tender fresh Kaju? I know the dry ones are no substitute at all, but who can beat all the upakari’smade with fresh kaju? BTW – I am neither GSB, CKP etc, but an Indian who celebrates the diversity of our cuisine.. and I love vegetarian Coastal food! And i would love to have the mangalore Sanna recipe with some Yummy veggie Gussi! thank you so much for this recipe! one question though – can you (or anyone else) provide quantities for the mustard seed, asafoetida, and curry leaves? i can estimate it and i think i might get it in the ballpark, but it would be great to have exact numbers. thanks! I am commenting in this field, bcoz i guess this was ur very first recipe posted and i wish to Congratulate u frm the bottom of my heart for completion of two years, one month of successful blogging!May the coming future make your blog a big success by reaching out to many more people like me who can make things easily by following your stepwise explanation,pics,accurate measurements and the lovely tips!!! THREE CHEERS TO U..HIP HIP HURRAY..HIP HIP HURRAY..HIP HIP HURRAY!!!! Shilpa: Thanks Purnima. You are so sweet. Yes, my blog was created on 28th of Jun 2005. It was a gift to me from my hubby, he told me to start the blog for a long time and when I was too lazy about it, he created it. Sweet anniversary gift isn’t it? Yes, indeed Shilpa…The best Gift..and you hv done justice to it..making it come alive !Talking of laziness..you are not even close to the L of lazy! But my laziness of cooking definitely vanished the day I hit on to this site! I hv ample on hands (native dishes)to try and many more merits due to AR! Many of your posted recipes have now become regular additions and not to forget the baking!You motivated me a lot! PS : And also -A belated Happy Anniversary to both of U! (I wd remember 28th June since my parents anniversary is on 10th of June – the lovely rainy month!) May God Bless you and fulfill all your wishes! could u pls tell me how much water do you add to this dal while cooking and do you mash up after pressure cooked???? pls tell the proper consistency of the dal. would love to try this simple dal. Shilpa: Lakshmi, while cooking dal, you usually add water till the dal is immersed in water and comes about 2 inches above it. You can mash the dal or leave it as it is. That is personal choice. Some people make it really watery and some keep it thick. I make it of Sambar consistency. As a true Konkani, I have grown up on a daily diet of ‘dali-toya’. Together with hot rice, it’s the best comfort food for the body and soul. Pressure cook dal with 1/2 tsp methi seeds. Once done mash it. Then add minced ginger, chopped tomato, slit green chillies & bring to boil. Lastly add chopped coriander leaves & season with oil+mustard+red chillies+hing+zeera+curry leaves. First of all thanks a ton for sharing your recepies. The title “aayi’s receipes is too good…and it says all..
i am a regular visitor to your site. from your site, its helpful. it should be cooked with water or in oil. The all important ingredient, WATER , has not been mentioned at all. The method described makes it Daali Sukken !! Anyway otherwise but your site shud be a great relief to the starters. There are many recipes of tambli on the site under gravy category. I went through your blog. The amount of effort than has gone into making this kitchen is amazing. Its become a family where friends get to try and share experiences. I am a KudaL Deshastha from Parula/Valaval/kankavali with MalvaNi cuisine. We too prepare similar dishes with variations taught by my aai/mothiaai(aaji). Thanks a lot.. i learnt to prepare a lot of konkani dishes. Hi, Saraswats, it is really nice to read how DDT (Dat Dat Dalitoy) can bond us all together. If ever there is rebirth I wish to be born as GSB once again purely because of the nature of people from GSB Community. “Happy go lucky and and can gel with anybody” ever open minded and benevolent. Love your blog. Just found it while looking for directions to make ghee. Thanks for your wonderful directions. I have bookmarked this site so that I can find more ayurveda recipes. Here are some subtle variations in making Dali Thoi. a) A small amount of separately cooked urad dal can be added to Toor dal while boiling (1:4). Gives it nice sliminess..
b) One may add a pinch of pepper powder to the dal. c) One may try adding 1/4 cup of finely chopped cubes of boiled potato to the dal while boiling. d) One may add few crushed curry leaves to the dal while boiling. e) Last but not the least,add some “Bhakthi”….. One MUST try one of the famous “Temple Daalithois” in one of the GSB temples! Radha, thank you. Will see if I can find it. I just had the most amazing and awesomely tasty dal recipe for lunch today at Konkani neighbours feast and I started searching in Google to know more about it and chanced upon your post. Loved everything about the dish. Hope I can replicate the same taste. Water may also be added as an essential ingredient!.